We have many crystal clear, blue-sky days and the view of the mountains and valleys below are breathtaking from a hot air balloon. There are two main companies in Park City that provide rides. Both have professional FAA-licensed pilots, offer a champagne and non-alcoholic beverage celebration after the flight. I see the advantage Morning Star Balloons has is they give you free digital photographs of your flight, but be sure to bring your own camera too! Morningstar also specifically says that they provide free transportation. Both companies prices are typically the same, around $225 for a 1-hour flight, but both can have have specials running at any time, so be sure to check their websites for deals. Be sure to call ahead for reservations! 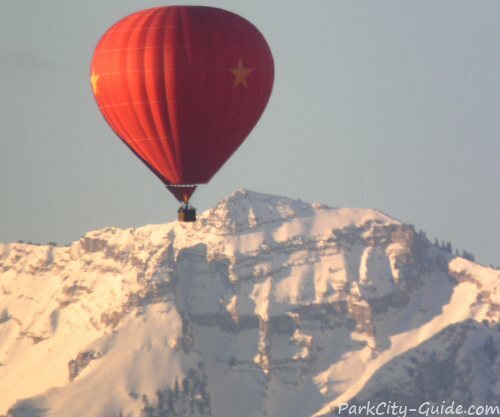 Winter Balloon Ride with Mt. Timpanogos in the Background. Morningstar offers free digital photographs of your flight and provides complimentary transportation to and from launch and landing sites. Many of the resorts use Morningstar including Stein Erikson Lodge (Deer Valley), The Lodges at Deer Valley, The Chateaux at Silver Lake (Deer Valley), The Miners Club (Canyons), and Westgate Park City Resort and Spa (Canyons). 1-hour flight: $225 per person.